I remember the first time I tried avocado: a shop assistant of a supermarket welcomed the clients with a tray full of pieces of beautiful green plain avocado prepared with toothpicks. Well, I did not find them really tasty and texture not really “special”. Only a few years later, while travelling, I discovered how good avocados are transformed into guacamole and other sauces. 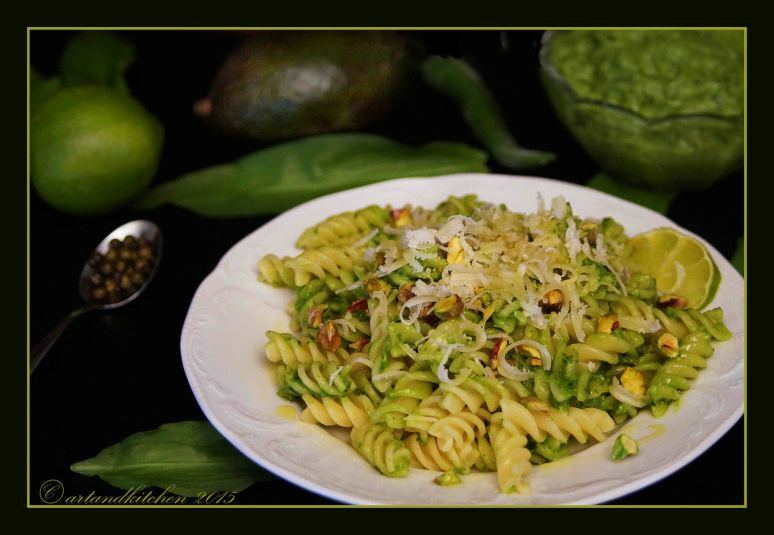 For this recipe I decided to blend together green ingredients and create a new pesto and try to take an almost monochromatic photo without forgetting the main purpose of the recipe: good food! The main green ingredients are avocado, wild garlic and pistachio, but in this recipe we have more green ones because I also added olive oil, green chili, green peppercorns and lime zest.